We offer our professional knowledge and expertise to every transaction – big or small. When you are buying or selling your home there is no small deal. It is always a big deal to you and your family. The average person does six transactons in their life – we coordinate real estate transactions everyday. So, when you’re buying or selling, you want to hire a trained and experienced professional who will give you the care and guidance you can depend on. Call us the Advanced Real Estate Team. We achieve this by taking advantage of the latest technology, state of the art tools, and a caring individualized approach. So when you are ready to sell and want results, Call us for a no obligation free consultation so we can prepare a personalized marketing plan that will work best for you. As a member of the Multi-List System (MLS) we are able to show and sell you ANY home in the area. You may also view homes in our area for sale at www.Realtor.com and www.haysmls.com. * Any home listed by any company – Don’t be confused by the term “Exclusive Listing”. If there is a real estate sign in the yard, no matter who’s name is on the sign, we can get an appointment. * Any listed home you may see at an Open House – Give the hosting agent one of my business cards and let them know we are working together. * For Sale By Owner Properties – If you see a For Sale By Owner, we can call the owner and arrange the showing and negotiate a contract on your behalf. * Any new home in a new home project – Give the hosting agent one of my cards and let them know we are working together. Don’t sign their guest registry until we can go to the project together. 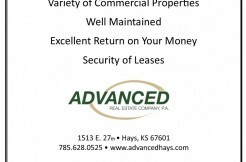 * Homes that may not be in the Hays area direct – Being licensed Realtors in the state of Kansas, we can prepare a legal binding contract for any property located in the state of Kansas. IF IN DOUBT, CALL US FIRST! It won’t cost you to have us involved protecting your interests.